On Saturday, June 14, 1902, a baby girl who was later named Julia was born to Maria and Vincent Pogrzeba in Oppeln, Silesia, Germany. On Saturday, June 14, 2002, Sister Adriana Pogrzeba was sitting in a wheelchair in St. Francis of Assisi Church celebrating her 100th birthday with her religious community and her friends. How did Sister Adriana journey halfway around the world and throughout an entire century? Julia spent her childhood in a small rural community in Germany. She attended school, helped with her six younger brothers and sisters, and became an active member of her local parish. When she was about 19 years old, her mother was hospitalized in Oppeln. While Julia was in the visitors’ lounge at the hospital, she met a young woman named Anastasia. While they were visiting, Anastasia told her that she was waiting to see one of the sisters about becoming a missionary to the United States. As time passed, Julia and Anastasia became close friends; Anastasia encouraged Julia to consider joining her as a missionary. Soon thereafter, Julia’s mother died and her father remarried. Even though her father had a sister who was a member of the Hospital Sisters, he strongly objected to Julia’s desire to enter the Community and go to the United States. Eventually, however, her father gave in to the request because of Julia’s persistence. In September 1922, Julia and five other young women boarded a train to Münster, Germany. While they were at the General Motherhouse, they received the “Postulant’s Cap” (a black bonnet with white ruffles around the face). Within six weeks, they traveled to America on an old ocean steamer from Bremerhaven to New York City. From New York, they took a train to Springfield, Illinois. Here Julia became known as Sister Adriana. Three years later, she professed her religious vows and began nurses training at St. John’s Hospital. Her education was interrupted several times to relieve a sister at one of the hospitals. Later, she obtained education as a laboratory technician. She spent many years serving in that role at hospitals in Illinois, Missouri, and Wisconsin. In her indomitable style, Sister Adriana relates that one of her biggest challenges was learning to cook. She was 75 years old when she moved from the monastic-style of living in the larger convents to a small residence with several other sisters in Belleville, Illinois. One of her first meals was stuffed cabbage, which she put in the broiler while she went to prayers with the other sisters. She states “I will leave the rest to your imagination.” Later, she learned to cook quite well and became famous for her pork chops. 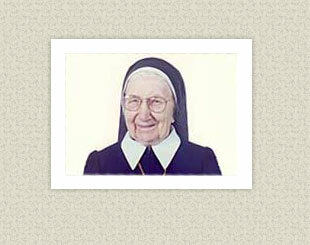 In 1993, Sister Adriana moved to the Motherhouse in Springfield. She is now a resident in the retirement area of the convent. However, she attends daily Mass with the Sisters, is “out and about” in her wheelchair and maintains a keen interest in world and community affairs. Sister Adriana has lived each day of her 100 years to the fullest in service to God, her religious community and the people of God!